ProBoat Zelos 36 Twin Flex cable assembly. 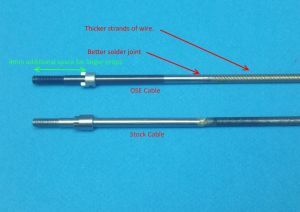 OSE .187" Cable with 3/16" prop shaft. This cable measures .187" (4.75) in diameter. The wire strands on this cable are a thicker gauge for added strength. We also increased the prop shaft area for larger props. No soldering or cutting required. These can be purchased as a set of left and right rotation or in a single cables if a replacement is needed.